Although Halloween has just been and gone, we’re still very firmly in the spooky time of year. 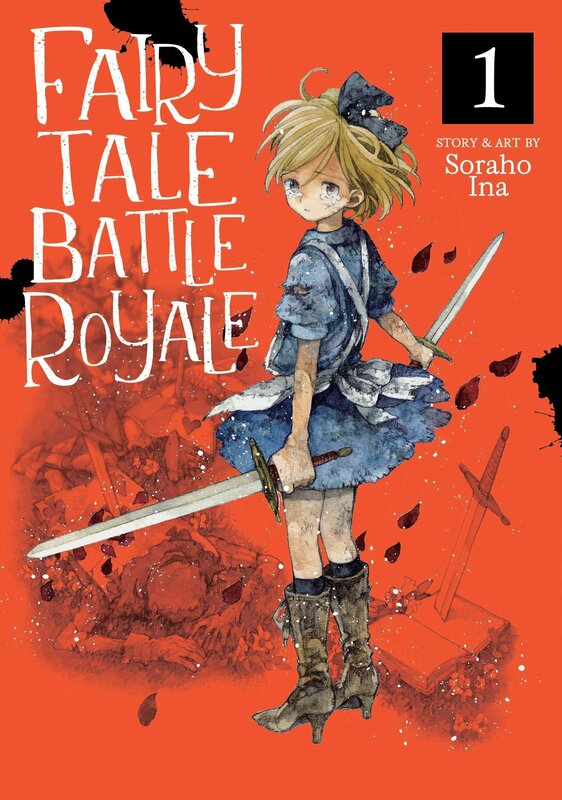 To celebrate this, today I’m checking out the first volume of Fairy Tale Battle Royale from Seven Seas Entertainment – a horror series which will leave you unable to look at your favourite fairy tales the same way ever again. At first Kuninaka believes that the contract is a joke being pulled on her by her classmates, but out of desperation our hero makes a wish: to become friends with everyone in her class. The following day Kuninaka is shocked when everyone in class is suddenly being incredibly friendly with her! Her life is finally looking up, but when Kuninaka gets home and touches the contract she’d signed the previous night, she’s suddenly transported to an oddly familiar world. When she awakens, Kuninaka discovers that she’s now dressed like Alice from Alice in Wonderland and appears to be in a place that looks just like Wonderland. As she explores her new surroundings and encounters characters from the story, Kuninaka becomes convinced that she actually is in Wonderland! However, our hero soon discovers that not all is as it seems, and she’s approached by Alice herself – but this Alice dies right in front of Kuninaka, leaving her with nothing but a book and the words: “This place now belongs to you, Aoba”. Seemingly stuck in this world, Kuninaka continues exploring and eventually comes across a young boy called Noah, who appears to be in the role of the nameless son from The Man, the Boy and the Donkey. The two decide to join forces to work out the mysteries of this world, and together they realise that this place is a patchwork of fairy tale worlds. Instead of the vibrant and captivating worlds the two recall and love from books, these lands are desolate. To make matters worse, it seems that the protagonists of these stories are out to kill those who don’t belong, like Kuninaka and Noah. In a kill or be killed world, just how will our heroes survive and will they ever make it back home? While I usually don’t cover horror manga for Anime UK News, it’s a genre that I have a surprising soft spot for. Sometimes it’s nice to sit back and read something so horrific that you’re sure to be having nightmares about it. The one thing I really liked about Fairy Tale Battle Royale’s set-up is that it’s playing with stories that are very familiar to us in the West. I’m sure many of us will have seen or read innumerable takes on Alice in Wonderland, so it’s instantly recognisable when Kuninaka is transported into it. It’s hard seeing worlds we love so much torn apart and in disarray, but it also makes the whole concept just that much more striking. It also helps that Kuninaka (and Noah later) are likable characters. Although Kuninaka is so badly bullied, she’s not depressive or too jaded about the world like many characters usually (and perhaps rightly) would be. In a series that is already quite dark, I’m glad Kuninaka is at least optimistic, if not happy. She has such a strong passion for fairy tales that it’s hard not to become attached to her fangirlish charms either. Having said all of that, I have a lot of respect for mangaka Soraho Ina and how they’ve built this story. While the first volume doesn’t really get far enough into the story to give us an idea of where the plot will go from here, it does do a good job at delivering what it promises in the synopsis. This is a dark story with creepy fantasy characters left and right just waiting to give you a fright. Ina’s artwork does a great job of conveying the sense of loss and emptiness in the fairy tale world, as well as making sure both the characters and the environments themselves were recognisable. Given that watching fairy tale characters fight it out with one another is the big draw behind this series, it’s obviously really important that the artwork does the story justice – and I was really pleased to see that it does. This release comes to English thanks to Seven Seas Entertainment and is available both in print and as a digital eBook. The series is on-going in Japan at 3 volumes and Seven Seas currently have Volume 2 scheduled for early February. Volume 1 of Fairy Tale Battle Royale includes colour opening pages and has been translated by Molly Rabbitt, a translation that reads well and is problem-free. Overall I enjoyed reading the first installment of Fairy Tale Battle Royale. If you’re not interested in a horrifying take on classic fairy tales then there is little of interest to set this series apart from the crowded genre. However, fairy tale fans looking for something different are sure to have a great time with this dark take on some of their favourite stories! When she's not watching anime, reading manga or reviewing, Demelza can generally be found exploring some kind of fantasy world and chasing her dreams of being a hero. Orange is a series that I would recommend on every front. It’s passionate, caring, heart-tugging and moving. The characters are likable, the story is believable, the artwork is really good, and it’s a short enough series that the Seven Seas complete collections are the perfect, affordable way to experience the manga. Orange: Future proves itself to be a worthy continuation of the original series. Filled with the same attention to detail and sensitive approach to difficult topics, this volume is definitely worth your time if you’re a fan of Orange. Bloom Into You is a thoughtful look at both what love is and how it can differ from person to person. Even if you’re not usually a fan of yuri series, I’d highly recommend checking this one out given how strong the story and its characters are. Regardless of your feelings on love, I’m sure you’ll find something to relate to.